Production: Mosfilm; black and white, 35mm; running time: 94 minutes, some sources list 97 minutes; length: about 8,697 feet. Released October 1957. Screenplay: Victor Rozov, from the work Eternally Alive by Rozov; photography: Sergei Urusevsky; editor: M. Timofeyeva; production designer: E. Svidetelev; music: Moisei Vaynberg. Cast: Tatyana Samollova ( Veronika ); Alexeï Batalov ( Boris Borozdine ); Vassili Merkuriev ( Dr. Fedore Ivanovitch Borozdine ); A. Shvorin ( Mark ); S. Kharitonova ( Irina ); K. Nikitine ( Volodia ); Valentin Zubkov ( Stépan ); Anna Bogdanova ( Grandmother ); K. Nikitine ( Volodya ); B. Kokobkin ( Tyernov ); E. Kupriyanova ( Anna Mikhailovna ). Award: Cannes Film Festival, Palme d'Or, 1958. Schnitzer, Luda and Jean, Vingt ans de cinéma soviétique , Paris, 1964. Rotha, Paul, and Richard Griffith, The Film Till Now , New York, 1967. Liehm, Mira, and Antonin, The Most Important Art: East European Film after 1945 , Berkeley, 1977. Klinowski, Jacek, and Adam Garbicz, Cinema, The Magic Vehicle: A Guide to Its Achievement: Journey Two , Metuchen, New Jersey, 1979. Krasnetskaya, M., Alexei Batalov , Moscow, 1983. Billard, Pierre, in Cinéma (Paris), June 1958. Martin, André, in Cahiers du Cinéma (Paris), June 1958. Monod, Martine, "Un Authentique Chef-d'oeuvre," in Lettres Françaises (Paris), 19 June 1958. Doniol-Valcroze, Jacques, "Par la grâce du formalisme," in Cahiers du Cinéma (Paris), July 1958. Leyda, Jay, "Qui est Kalatozov," in Cinéma (Paris), July-August 1958. Dyer, Peter John, in Films and Filming (London), November 1958. Cros, J. Louis, in Image et Son (Paris), November 1958. Image et Son (Paris), December 1959. Lifton, Michael, in Film Quarterly (Berkeley), Spring 1960. Hibbin, Nina, "Ivan the Magnificent," in Films and Filming (London), February 1963. Anninsky, L., in Film a Doba (Prague), 1971. Yutkevich, S., in Iskusstvo Kino (Moscow), March 1980. Zorkaia, N., in Iskusstvo Kino (Moscow), no. 5, 1995. Along with Grigori Chukhrai's 1959 film Ballada o soldate ( Ballad of a Soldier ), Letyat Zhuravli won immediate acclaim on its release in the West, including the Palme d'Or at Cannes in 1958, because of its radical departure from the Socialist Realist style that had dominated Soviet cinema under Stalin. It was the product of the slight easing of constraints on Soviet film-makers at the end of the 1950s, following Khrushchev's famous denunciation of Stalin's crimes at the 20th Congress of the Soviet Communist Party in 1956. This shift is most apparent, perhaps, in the way that the film replaces the abstract entities—such as "the people," "the workers," or "the nation"—that had dominated and defined the narratives of Socialist Realist cinema, with individual characters and their personal aims and desires. Predictably, this was hailed by critics in the West as a welcome return on the part of Soviet cinema to the "universal" themes of humanism that have "no awareness of geographical or political bounds," as Bosley Crowther aptly put it in his review of the film. However, Letyat Zhuravli goes further than a simple focus on individuals, in its use of the conventions of classic melodrama and its relentless emphasis on the emotional vicissitudes of the romantic couple, to weave its narrative of innocent love ruined by the arbitrary events of a cruel war. Veronica, a young Russian woman living in Moscow just before World War II, loves Boris, a factory worker, and they plan to marry. However, when the German army attacks the Eastern Front, Boris dutifully volunteers to fight, and triumphantly marches off to war with his fellow workers. Veronica, left homeless and alone in Moscow after a bombing raid in which her family dies and her home is obliterated, is invited to live with Boris' family by Boris' kind father Fyodor. However, during another dramatic bombing raid, she makes love to Boris' selfish, draft-dodging cousin Mark, and then marries him—even though she still loves Boris—much to the dismay of Fyodor and his family. While Veronica lives miserably with Mark, yearning for letters from Boris and spending her time nursing wounded soldiers, Boris is killed in action. Eventually, Fyodor throws Mark out of his home, having learned that he is a draft-dodger, and Veronica leaves her husband to stay with Boris' family, caring for an orphan she has adopted. Learning of Boris' death from a soldier in his regiment, she nevertheless holds out hope that he has somehow survived, until, in the final scene, she goes to welcome the troops back home from the front and is informed by Boris' closest friend that he had seen Boris die with his own eyes. Now accepting Boris' death, she hands out the flowers she had bought in the hope that Boris would return to the soldiers around her, as a flock of cranes flies over Moscow for the first time since the beginning of the war. As this synopsis indicates, Letyat Zhuravli is a fairly standard melodrama. The cruel disruption of a young romance by an outside event over which the protagonists have no control: the "evil" relative waiting in the wings to exploit the heroine's loneliness and vulnerability, the "true" emotions which cannot be expressed because of circumstances, the love that persists in the face of death—all of these are familiar from countless Hollywood narratives. 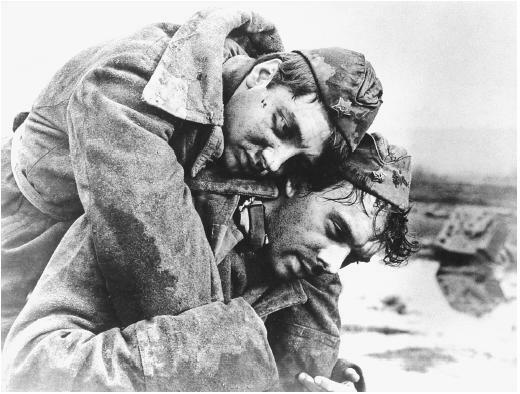 However, within the context of Soviet cinema, the use of a melodramatic plot in a wartime scenario is highly significant. In the cinema under Stalin, the trauma of World War II, in which one in ten Russians lost their lives, had been overwhelmingly represented in terms of the clichés of willing sacrifice and patriotic collective duty, and even the slightest hint at personal suffering had been rigorously excluded. In Letyat Zhuravli , however, suffering, as personified by Veronica, is both foregrounded and made into the very dynamic that drives the narrative forward. It is the pathos of Veronica's desperate hope that Boris is still alive, when we the audience know he is dead, as well as the impossibility of Veronica's own circumstances—her hapless and unhappy marriage—that sustains the central drama. Just as crucially, Veronica's suffering is explicitly linked by the film's melodramatic structure to the war and the topsy-turvy world war produces. Once the war begins, confusion reigns and the safe, habitual social order of the opening sequences of the film is turned upside down. Veronica, for example, cannot find Boris to say good-bye to him in the mass of soldiers marching off to war, and it is in the confusion of a bombing raid, amongst darkness, breaking glass and explosions, that Veronica falls prey to Mark. Thus, Letyat Zhuravli boldly appropriates melodrama to articulate wartime suffering. However, it is also equally distinctive in its use of techniques reminiscent of the revolutionary Soviet cinema of the 1920s prior to the onset of official Socialist Realism. Dynamic, angular framing, extreme closeups, and superimpositions all combine to create a highly expressionistic film, and it remains interesting today just as much for its stylistic as well as its narrative break with Stalinist Soviet cinema.